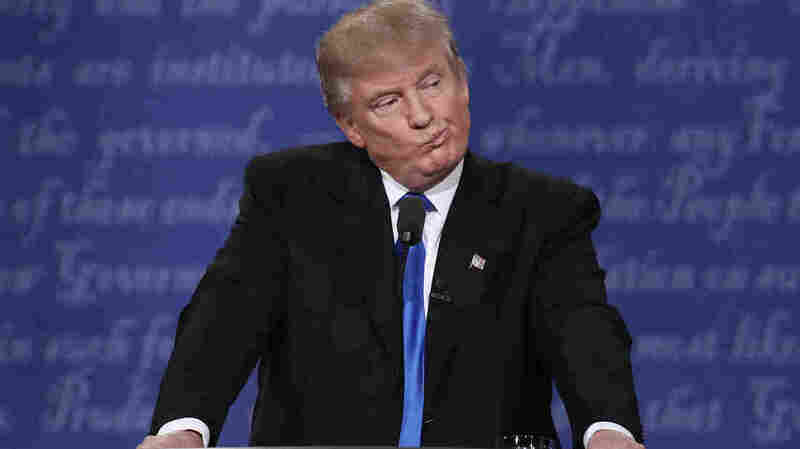 Mic Check: There Was Something Up With Donald Trump's Debate Mic The Commission on Presidential Debates issues a cryptic statement acknowledging problems with Donald Trump's microphone during Monday's debate. Republican presidential nominee Donald Trump told reporters there was an issue with his microphone during Monday's debate. In a cryptic statement that raises more questions than it answers, the Commission on Presidential Debates says there was something going on with Donald Trump's microphone during Monday's prime-time showdown with Hillary Clinton. Trump had complained on Fox and Friends the following morning that problems with the sound system might have detracted from his performance in the debate. "My microphone was terrible," Trump said. "I wonder, was it set up that way on purpose? My microphone, in the room they couldn't hear me, you know, it was going on and off. Which isn't exactly great. I wonder if it was set up that way, but it was terrible." Trump's excuse drew a mocking response from Clinton. "Anybody who complains about the microphone is not having a good night," Clinton told reporters. But now the bipartisan commission that organized the debate admits Trump may have a point. "Regarding the first debate," the commission said in a statement, "there were issues regarding Donald Trump's audio that affected the sound level in the debate hall." NPR has reached out to the commission for more information but did not receive an immediate response. Any problems with the microphone did not affect the television broadcast, which was seen (and heard) by some 84 million people.